The design of the iPhone was risky and challenging, Apple designer Chris Stringer testified on Tuesday. Testifying in a federal court in San Jose, Stringer said that his team had doubts at times it could make its designs work. “I’m aware Steve Jobs himself had doubts,” Stringer said, appearing as the first witness in Apple’s landmark patent case against Samsung. The approach Apple took was a dramatic departure from what existed, Stringer said. In its case against Samsung, Apple is arguing that its rival took what Apple developed and “slavishly copied” it. 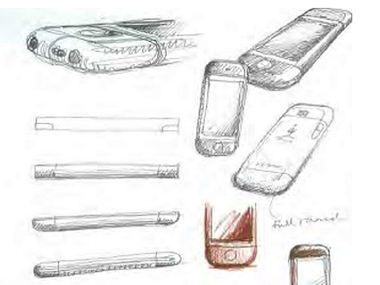 Samsung has argued that it was inspired by the iPhone, but did not copy it, and that Apple, too was inspired by others. The iPhone design Apple came up with, Stringer said, was “something breathtaking.” However, it was also hard to polish, difficult to manufacture and hard to produce in volume. “People thought we were crazy,” Stringer said. The iPad, too, had its challenges, particularly in getting the space between the glass and housing as close together as possible. Earlier in his testimony, Stringer provided unique insight into the way Apple’s 15-member design team bounces ideas around a kitchen table.